Every new console or handheld needs that one game. That one title that you show first to friends, family and co-workers. The one that makes them go "ohhh, that's neat", and makes you feel better about spending all that money you're already slightly regretting. LittleBigPlanet is that game for the PlayStation Vita. Why? Because it strikes a perfect balance between the familiar and the new. 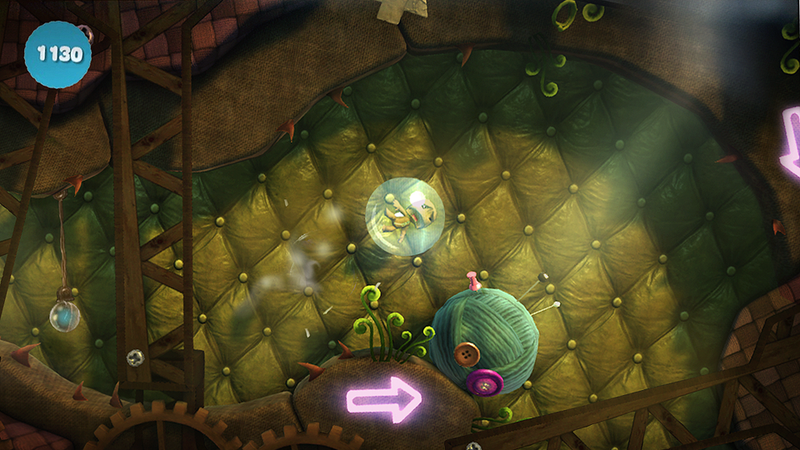 After two PS3 games Sackboy is established enough as a company mascot to ring people's bells, but on the Vita, his adventures (and the way you adventure him) are unique enough to make LittleBigPlanet stand out from its console siblings. In some ways, it feels like a DS launch title. There are features and prompts everywhere to use all of the Vita's bells and whistles. You press buttons, you tap the screen, you caress the screen, you even rub the Vita's rear touch panel. Yet unlike many early DS titles (and, let's face it, the Vita will share/suffer the same fate), this doesn't feel like a novelty or a sideshow. It fits the game perfectly. LittleBigPlanet is a mad-cap smorgasbord of a game, a little bit of this, a little bit of that, sometimes a platformer, sometimes a shooter, sometimes a puzzle game. So being asked constantly to perform a different action didn't get frustrating over the five or six demo stages I played earlier today. Not one bit! It just felt like part of the game. Oh, so I'm in a bubble underwater? Sure, I'll swipe the screen gently to move (and the screen responded in kind with gentle precision). Now I'm on a flying fox? Yes, tilting the Vita makes perfect sense. As did tapping the back pad to move Tetris blocks, sliding your finger over the front to play a piano or directly interacting with blocks on the screen by moving them around with my finger. If this all sounds a little crazy for crazy's sake, don't worry; there's still basic platforming on offer, using nothing more than thumbticks and buttons, so if you prefer your LBP levels to be a simpler affair, that kind of game is still there. It's now just got an extra layer of interactivity sprinkled on top.